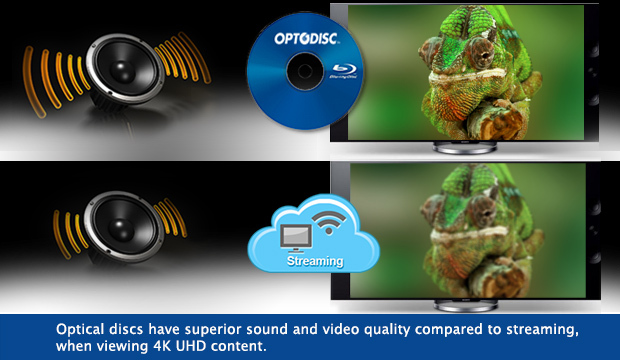 Optical discs have superior sound and video quality compared to streaming, when viewing 4K UHD content. There was a recent article by Peter Suderman, titled; Why DVDs and Blu-rays remain essential in the age of streaming. In this article, Mr. Suderman showcases how streaming cannot produce the exceptional sound quality and the hi-resolution picture brilliance that is commonplace with HD video content stored on Blu-ray optical discs. The gist of the article is that there are a number of reasons why a physical disc is better than simply using a streaming service, however the two most prevalent is that streaming cannot capture the true video and surround sound quality that a 4k Ultra HD (UHD) Blu-ray disc can provide. With TV sizes increasing to such large dimensions and surround sound capability increasing to rival that of the actual movie theater experience, it doesnâ€™t matter if your content canâ€™t take advantage of your hardwareâ€™s capability. In order to stream true UHD, there are two factors to consider, firstly, the internet and wifi capacity and quality in the area that the streaming would take place. If the viewer doesnâ€™t have the bandwidth or signal strength to stream 4k, they simply wonâ€™t be able to watch at all or there could be a number of buffering (freezing) issues that would detract from the viewing experience. Secondly, for those that do have the capability to fully stream 4k, in order to stream 4k efficiently, it has to be compressed, which then reduces the final products full capability. This is mostly evident in the darker hues of color and the full dynamic sound quality. So whether you are an audio/video aficionado or just a casual viewer, to get the true UHD experience, you must have physical media. I donâ€™t see this changing in the near future as content will only become denser and require greater and greater bandwidth or higher compression to stream properly, which will have degradation of quality to some level or another. That is why Vinpower will continue to focus on physical media and methods to produce exceptional high quality duplication of any digital content. For more details about Vinpowerâ€™s offerings, please visit our website, www.vinpowerdigital.com, or contact a Vinpower representative near you.